Attendence was around 50 people. This years fest was moved to a new location at the last minute because DeVon and I had just closed on a new property two weeks prior. Our new home came with a beautiful Morton building in the back that was destine to become our new shop. Problem was it was just a large empty room with a couple offices in the back. 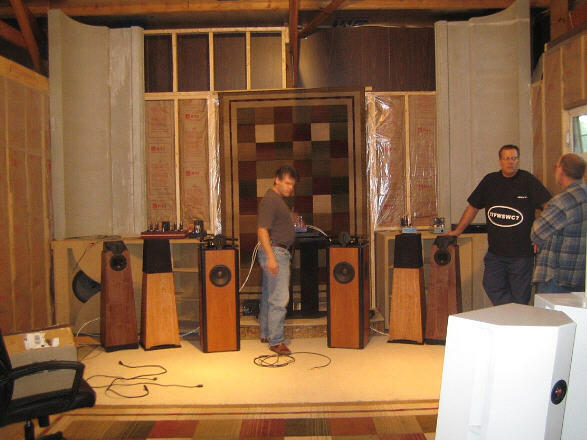 We had the task of constructing a usable shop and listening room before we could move the business. About a week into the construction my friend Paul and I brought the Imperial S.O. 's over to the new building and some speakers and a Zen amp so we could hear what the place sounded like as we prepared to frame up the listening room. Interestingly enough, the stereo sounded great in the large cathedraled out space, the bass was near perfect. 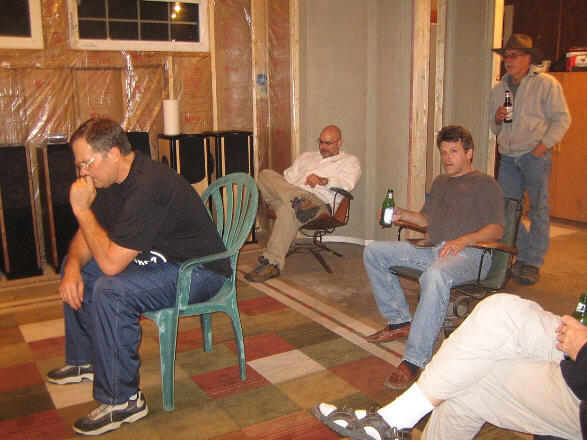 We decided right then that we should have the fest at the new location knowing full well the shop and listening room would barely be framed up by then. But we knew it would sound okay, and there would be plenty of room and the karma here was simply great! 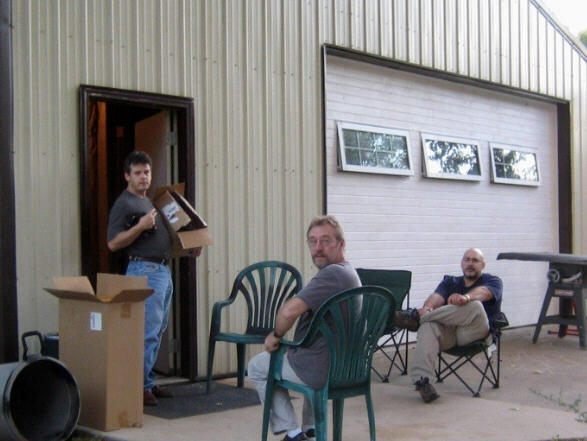 Pictured in front of the new building from left to right is Chris, Bob, and Rob getting ready Thursday before the fest. One of the first things I had to do with the building was get rid of the 10x16 garage door and replace it with a wood wall that looks like a garage door, at least it does when the windows are shut. 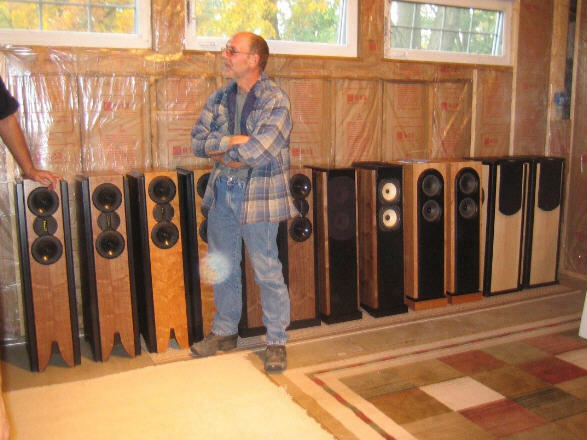 Here I am standing on the other side of the wall in what is to become the new listening room. Yes, I'm too short to see out the window, but if you're going to have glass in a listening room, why not keep it above the reflection zone so they don't effect your listening. The little orb floating by my knee is some of that karma I was mentioning! 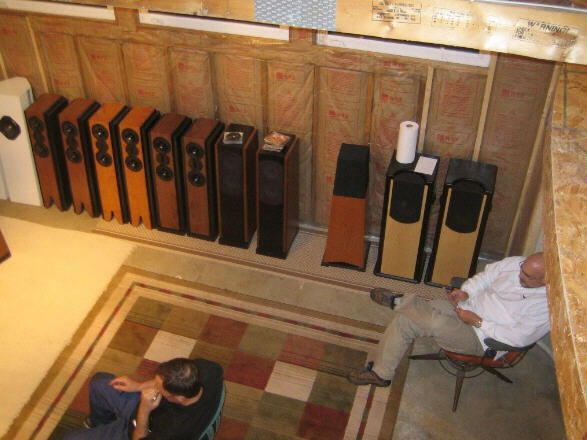 The speakers along the wall are a pair of MG944's in Walnut, next to that a pair in Cherry and next to that a pair in Walnut with the optional Plenth and no slot in the front. The speakers next to that with the two white Fostex drivers are a pair of prototypes that will soon be retailed through dealers under the Deckert & Zeigler trademark. The pair next to those are Chris's (pictured in the frame before this one) prototypes of the same thing. 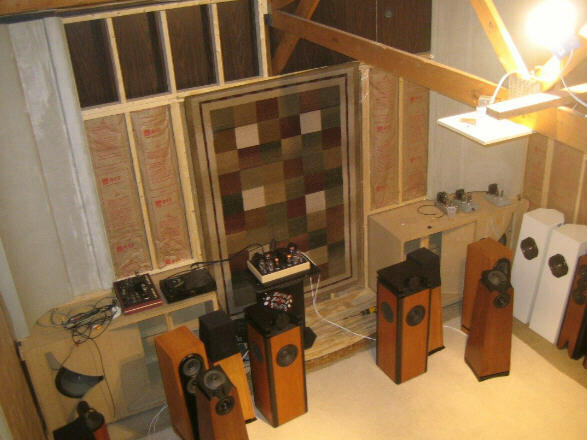 The last pair on the end are a pair of HDT's using the new DFR-8 drivers. This pair is in maple. The hand in the far left of the picture is of someone who obviously CAN see out the windows. Yes, I was right, the hand belongs to Tim, one of my favorite Texans with his other hand on a pair of Deckert & Ziegler Radials done in Walnut. These are a new design from the bottom up using a transmission line internally to load it's new drivers. A pair of RL-3's are sitting just inside them done in Cherry with the grills on. This particular pair are prototypes that use a small 4 inch Fostex driver and no tweeter. A bit different from the standard RL-3's that use a 5 inch driver and ribbon tweeter. On either side of Chris in the middle are the HDT MK II's also done in Cherry but a couple years older than the RL-3's. Cherry darkens with age. 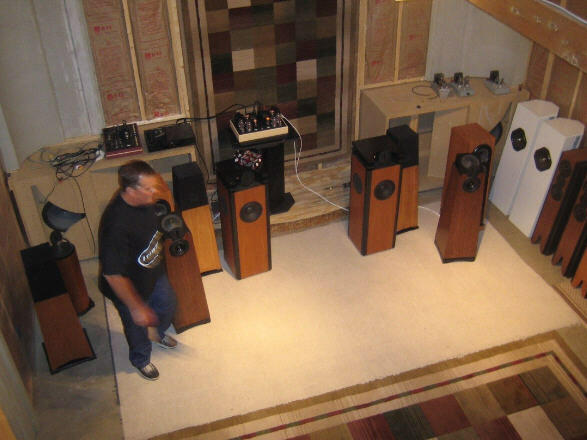 You can kind of get a sense of the front wall of the listening room with the Imperial S.O. 's semi-built into the lower corners of the room. 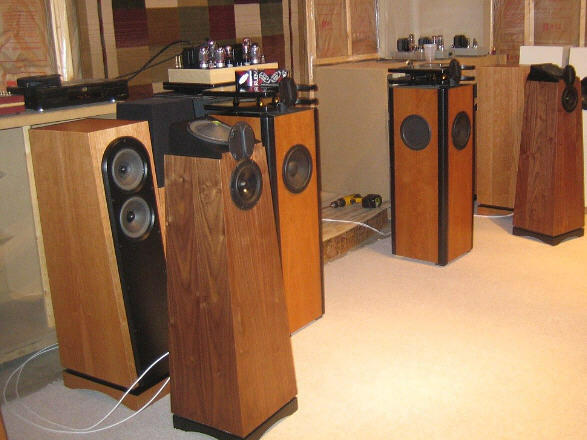 The white speakers in the foreground are a pair of the NFX seen from the rear. The slot in the sides are barely detectable in this picture. 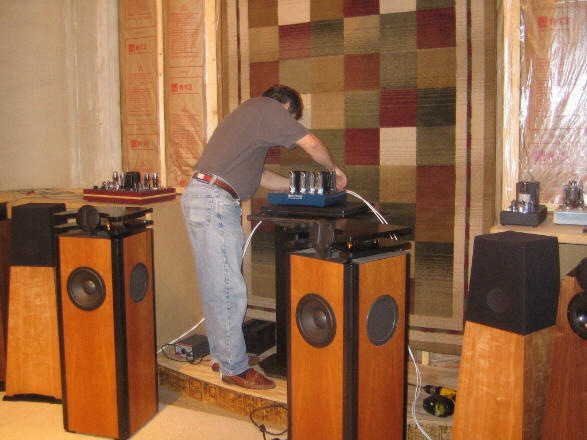 Here is Chris hooking up his Original Blue Torii to one of the pair of speakers. The piece sitting to his left is a 6 channel preamp I've been working on over the past year and will be demonstrating at the next fest in 07. If you swing around and look left and up you see my daughter Sarah (spittin image of her mother, DeVon) standing upstairs. 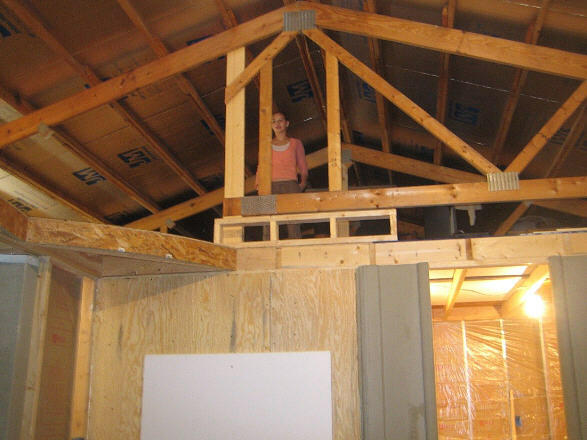 The truss will eventually be removed and a handrail will wrap the room. There is also a curved balcony over the rear of the room that is not seen in this picture. Some late night listening the night before by Tim, Rob, Chris, Bob's legs, and myself. Okay, Bob was all there, it was just the picture, my fault... Bob Ziegler ladies and gentlemen. 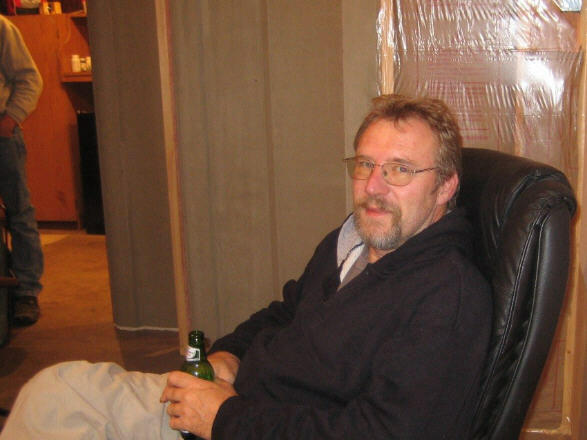 This is Bob, the master behind the woodwork. Together we make the wood sing. Expect a whole lot of exciting things from this man as like myself he too has just completed a move with a new house and shop. Both of us are now out of the city in wooded areas where there is a lot less static on the dial if you know what we mean! We're listening to Deckert & Ziegler transmission line Radials with the Torii Mk II. This picture gives a nice close up of the speakers. 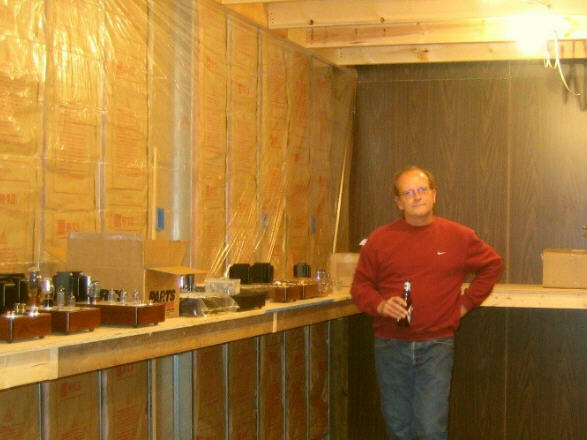 And here is Denis enjoying our favorite beer from Poland standing in what would become our main work area. Denis and I are the two who build all of these lovely Decware amplifiers. Sitting on the bench are several of the new Anniversary edition amplifiers from Decware. Here is a view of the listening room from the corner of balcony. Behind Tim who just flipped in a new CD are the RL-3's and the RL-1.5's. Yea, this room is going to be good. It is already good enough that during the fest no one asked to see or hear our reference room at the old shop, which was left in tact with plenty of gear just in case. 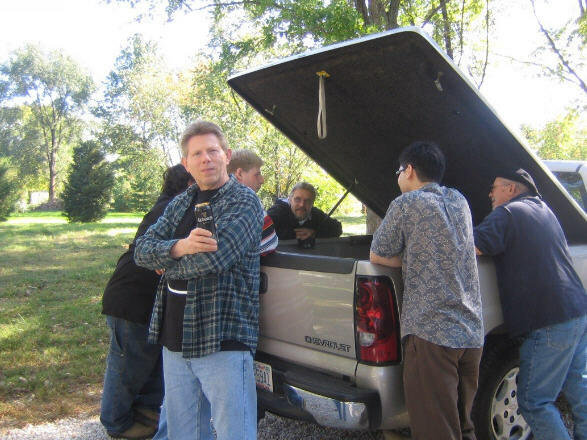 Another view from above, with Rob seated in the back. And another view of what will eventually become diffusers that turn into a movie screen. Yes, to start the R&D last year on the 6 channel preamp we created a Tuesday night movie night where Paul, Denis and I would get together and watch movies on an ever changing combination of gear. We grew to enjoy this quite a bit, so we're looking forward to continuing the research with a huge picture instead of the 3 x 7 foot door we were projecting on. Finally the last of the pre-fest team is here with Randy and his son Jeff's arrival. 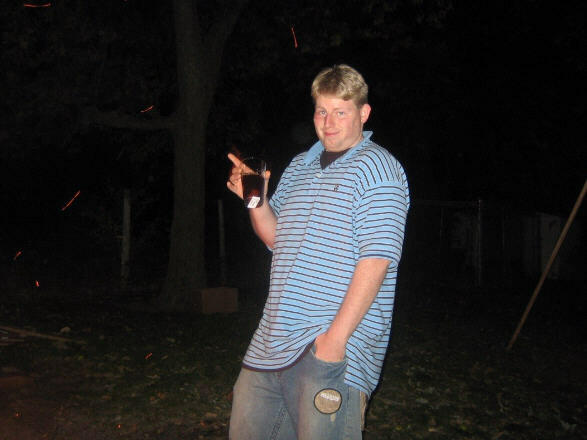 Pictured above is the little Yegermiester himself, Jeff and this officially starts the 2006 Decware Zen Fest. 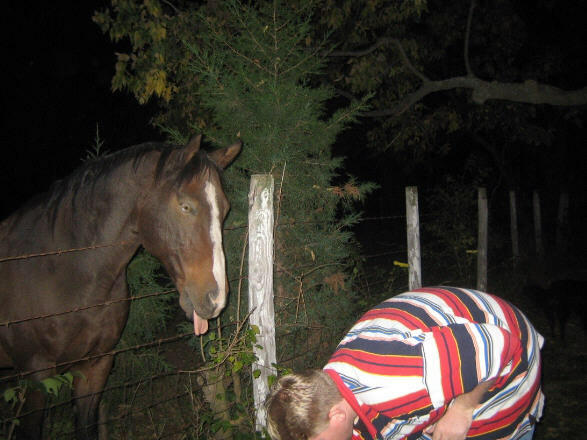 You can see this is the first time Stetson (the horse) has met Jeff. He was playing the see how many times I can drop the apple and get him to pick it up game. And pictured below in the foreground is the proud Dad, Randy from Kentucky. Standing at the tuck with their backs to us are Walter and Dennis chatting with Bob on the other side. The weather was perfect for the entire fest and many thanks has to go to Randy for once again supplying a rather larger portion of the fine beer! Fest pictures continued in part 2.